Babblings of a Mommy: My Fav Lip Balm. If there is one beauty product that I use every. single. day. 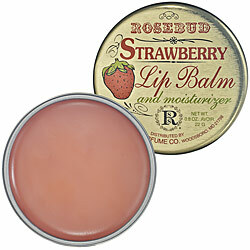 it would have to be Rosebud Strawberry Lip Balm and Moisturizer. Regardless if I'm wearing any other make-up or not, I'll slather on some of this lip balm to smooth and soften my lips. It-works-awesome! Not only does it smell deliciously sweet, but it practically works miracles on dry lips. My daughter used to get really chapped lips before, and ever since I started using this lip balm on her a few months back, her lips stay completely soft and moisturized. We've almost become a bit obsessed with it--I have one on my nightstand and carry one in my purse at all times, just in case either one of us needs a little touch up. It's very lightweight and sheer and is not at all sticky like some other lip balms. I absolutely ♥ it!